It’s summer and time to for everyone to break out their sundresses… err, upon seeing our pasty, pasty legs, maybe not. Hey, ladies! Don’t let your porcelain skin keep you from wearing what you want this summer. Using self-tanner will allow you to revive the tone of your skin. You can either fake a summer tan, or just bring your translucent self a little bit closer to a more human-like color. I may be of Greek heritage, but my skin is 100% Irish. I’m pale and burn easily. I also tan very, very slowly. The immense time and risk of damage it would take to tan my skin is, frankly, so not worth the tan. Yet, I was way too timid to try self-tanners. For fear of looking like Charlize Theron at the 2003 Academy Awards. Hell to the no. However, I work for beauty retailer, and they gave me some free samples of the stuff. So why not? I gave it a shot, and…… I AM A CONVERT. The brands I tried, and thoroughly recommend, are St. Tropez and Vita Liberata. Here are the steps you should take to ensure an even, long lasting tan, to get the most out of these products. Step 1) Buy the mitt! When purchasing your self-tanner, for the love of God, buy the mitt. Both brands sell them. Even Sephora sells their own self-tanner mitt. These mitts are reusable (aka not just a one time use thing), and they make a huge difference. The mitts not only prevent your hands from getting that tell-tale orange color, but they make your tan go on evenly. Before you slap on the self-tanner, you need to get rid of all the built up dead skin cells are product on your skin which could prevent an even tan. You’ll need a gritty body scrub that contains NO oil or butters. You can purchase one like Soap & Glory’s The Scrub of Your Life or Bliss Hot Salt Scrub. You can also make your own using brown sugar, regular sugar, salt, or even old coffee grounds There are tons of recipes out there. Find one that uses stuff you have in your own kitchen! Now you’re going to want to scrub yourself down. Use small circular motions and make sure to concentrate on your feet, knees, and elbows. These areas are rougher and can absorb more self-tanner product than other areas, causing them to tan slightly darker. You should also exfoliate your face. You should use a less rough, more gentle scrub. Either make one or purchase one, like Fresh’s Sugar Face Polish. To go the extra mile, follow up with a face exfoliant containing chemical exfoliants, like Kate Somerville’s Exfolikate. Now shave your legs, arms, etc. This isn’t a step so much as it is a NON-step. Self-tanner needs direct contact with the skin to work most effectively. Do not put moisturizer or anything else on your skin. A client once asked if there was a primer she should use before self-tanning. Great question! Nope. Bare, bare skin That’s all. Squeeze some of your lotion or mousse self-tanner onto your body mitt. You want to work from your bottom to your top. Why? As you are working the self-tanner onto your body, you don’t want to apply the tanner to your arms and chest, then bend over to do your legs and find you created a giant crease in your stomach or smudged your arm. It works better doing your legs first. Use small, circular motions to rub the self-tanner into your skin. I recommend putting a LITTLE bit of self-tanner over the tops of your feet (you don’t want totally white feet), but be careful not to put any in between your toes or on your heels. It will get too dark here. 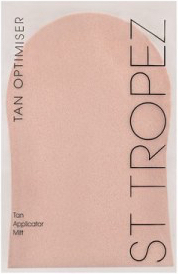 St. Tropez sells a specific self-tanner for the face that’s noncomedogenic (aka won’t clog pores). Unless your skin is super sensitive, you should be alright using the body self-tanner on your face. I recommend leaving the self-tanner on as long as possible. Trust me. Even if you’re the palest of the pale, you’re using the self-tanner to get some color. You want it to last. Do all this at night. Go to sleep. Then get up in the morning and take a shower. This will allow your tan enough time to fully develop. A) If you purchase Vita Liberata’s Luxury Tan 4-7 Rapid Tan Mousse, it will go on very, very dark. You will look like you baked on the sun. Do not, I repeat, do not panic. About 80% of this color will wash off in the shower. I freaked out and washed it off too soon, finding I was left without much color. But do this only when you don’t have to go outside at all! Otherwise, you will look silly. Plus, it goes on a little splotchy. Don’t worry, these splotches generally aren’t visible after you wash it off. It says to leave it on 1-3 hours depending on how deep you want your tan. If you truly want a tan, leave it on all night. B) If you wash your face every day, your self-tanner if going to fade a lot faster there. One way to keep you your tan on a daily basis is to use Clarins Radiance Plus Golden Glow Booster. Add anywhere from 1-3 drops of this ingenius product into your face moisturizer, and this self-tanner will maintain your glow!